The Kolkata professor was removed after the Student-Teacher Committee of the International Relations department — in which Sarkar teaches — recommended that he be removed. 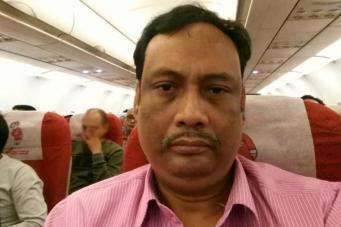 Kanak Chandra Sarkar, the Jadavpur University professor who sparked massive outrage with a Facebook post in which he compared a woman’s virginity to a “sealed bottle”, has been taken off his duties with immediate effect and also been barred from entering the varsity campus till the completion of an inquiry by Women’s Commission. The Kolkata professor was removed after the Student-Teacher Committee of the International Relations department — in which Sarkar teaches — recommended that he be asked to stop teaching. Condemning Sarkar’s misogynistic comments, Jadavpur University Vice-Chancellor Suranjan Das said: “His comment has maligned the image of the university. It’s disgraceful. This cannot be tolerated. We have decided not to allow him to enter JU campus till inquiry is finished,” he added. The students of the university had on Tuesday submitted a written complaint to the authorities, demanding the immediate removal of Sarkar, who specialises in political sociology, political thought, the Constitution and government, human rights and law, development administration, and ethnicity and terrorism. Rekha Sharma, Chairperson, National Commission for Women (NCW), has sent a letter to West Bengal DGP Virendra, asking him to take appropriate action against the JU professor. “The NCW has come across several media reports regarding the professor’s shocking misogynist lessons on ‘virginity’. I request you to investigate the matter and take appropriate action as per the relevant provisions of IPC and subsequently, the commission be apprised a feedback in the matter at an early date,” reads Sharma’s letter to the DGP. In another Facebook post on Sunday, Sarkar sought to clarify his views and said the Supreme Court had given freedom of expression on social media by repealing Section 66A of the Information Technology Act.